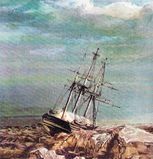 In around 1865 and 1875, Perenchins, a 500-ton sailing ship, was shipwrecked at the entrance of the Trece inlet. It was a wooden ship loaded with wood. All crew members were saved.